On November 22nd, Telefónica celebrated the third edition of the Data Science Awards Spain 2018 prize giving, the only awards in Spain that give social recognition to professionals in the world of data and Data Science. Winners of the Data Science Awards 2018. 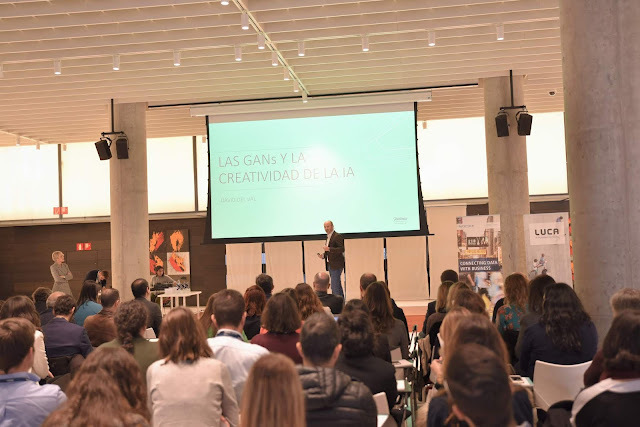 The main hall in Telefonica´s central building welcomed more than 80 people to the awards ceremony that consisted of three categories: Best Data Scientist, Best Data Journalism Work and Best Entrepreneurship. The day began with Mercedes Estrada, Product Marketing Manager within LUCA, who welcomed and highlighted the great participation of this event, with more than 360 projects being presented. "In this third edition, due to the projects presented we have seen the maturity that data science has acquired. The ecosystem of disruptive technologies increases and evolves, it continuously develops in leaps and bounds, "he said. David del Val, director of Core Innovation of Telefónica and CEO of Telefónica I + D, was in charge of the prelude to the awards with a keynote entitled "GANs and AI creativity" in which he showed the state of the art application of artificial intelligence algorithms called "Antagonic Generative Networks", used to, among other things, generate content (whether images, photographs, videos, etc.) from scratch by the machines themselves. David del Val, director of Core Innovation of Telefónica and CEO of Telefónica I + D.
Later began the delivery of prizes. First, the prize for Best Data Scientist was won by Pablo López Álvarez, with his project predicting early phases of Alzheimer's. Its model of machine learning is able to estimate if a patient is in an early phase of this disease thanks to the study of the data processed by a MEG machine (manegmentencephalography), based on brain activity of patients through 102 sensors placed on their head. The judges highlighted the viability of this project that could be developed in a real medical environment. In this category, Manuel López Martín received an honourable mention for his methodology used in the presented project. The prize for the best journalistic data work was obtained by the Civio Foundation, for its complex journalistic research on the use and access to contraceptives worldwide around economic, social and religious variables, and for the visualizations presented to reflect results obtained. Europa Press won an honourable mention for the best journalistic strategy with its EpData proposal, a platform with the objective of integrating all the opportunities offered by Big Data to improve the quality of information and fight against false news on the Internet in a collaborative way. Finally, the Prize for the best Big Data business initiative was achieved by Repsol, with its ambitious commitment to digital transformation that has led it to generate more than 400 initiatives based on analytics and data management. This initiative has given rise to a project that predicts, in real time, the quality of the product that it produces with an advance of 15 minutes, which allows modifications and improvements before its completion; a project in which 16 of Repsol's production centres are already benefiting. The Mention of Honour to the best business strategy of Big Data was obtained by Naturgy for its strategic plan to include Big Data technologies and Artificial Intelligence within the company, from the delivery of Big Data training at all levels within the company to the creation of a centre for analytical excellence where cases of advanced analytics and Big Data can be developed. Elena Gil, CEO of LUCA and Global Director of Big Data B2B at Telefónica, closed the day by thanking the attendees and especially the participants and winners of this edition for the quality of the projects presented.